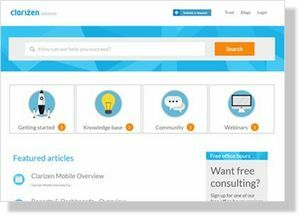 SAN MATEO, CA--(Marketwired - Jun 23, 2015) - Clarizen, a global leader in collaborative work management software, today announced the launch of its all-new customer community and support site, Clarizen Success, to deliver first-class online customer service. The comprehensive portal serves as a one-stop knowledge base and training center, promoting collaboration between customers and the Clarizen team on questions and new product ideas. In addition to merging Clarizen's community, user manual and ticketing system, Clarizen Success also features a sleek, modern design, built specifically to streamline the user experience. A leader in collaborative work management, Clarizen combines powerful project management, flexible workflow automation and purposeful collaboration into an enterprise-grade platform. Clarizen unites teams, centralizes communication and provides complete transparency so everyone can work more efficiently, adapt to changes and deliver results. "We've significantly invested in the new Success Site as part of our focus on the 'white glove' customer experience," said Chris Bates, VP of global customer success, Clarizen. "Customers in the modern workplace are no longer satisfied with static support solutions. The new Success Site, alongside our enterprise-grade, collaborative work management platform, delivers a more comprehensive solution that allows them to meet business challenges and accelerate the speed of doing business in today's competitive economy." 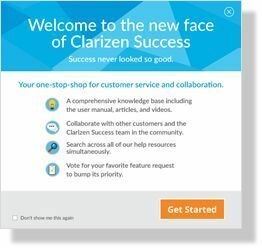 To access the all-new Clarizen Success Site click here, and to stay up to date on best practices for collaborative work management, subscribe to the Clarizen Blog. Clarizen is a leader in collaborative work management, bringing together powerful project management, flexible workflow automation and rich collaboration in an enterprise-grade platform. Thousands of organizations across 69 countries, including dozens of the Fortune 500, rely on Clarizen's award-winning solution. The privately held company has locations all around the world, with regional headquarters in San Mateo, CA, Tel Aviv, IL and London, UK. For more information, visit www.clarizen.com.